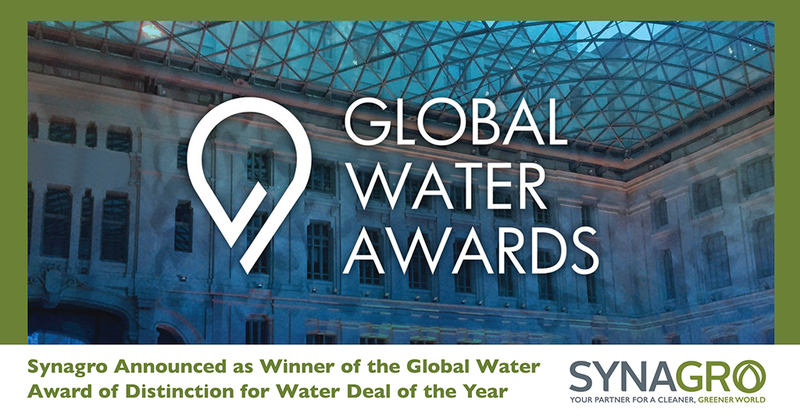 BALTIMORE, Maryland, August 7, 2018 –Synagro Technologies, Inc., the preeminent provider of biosolids and residuals solutions services in North America, is proud to have been named as the winner of the Global Water Award of Distinction for Water Deal of the Year for the financing of a biosolids facility in partnership with the City of Hamilton, Ontario. Each year, the coveted Global Water Awards are presented at the Global Water Summit, the major business conference for the water industry worldwide. The 2018 awards were presented at the Pavillon d’Armenonville in Paris, France on April 16, 2018. Established in 2006 by Global Water Intelligence, the awards recognize the most important achievements in the international water industry within several categories, and reward those initiatives in the water, wastewater and desalination sectors that are moving the industry forward through improved operating performance, innovative technology adoption and sustainable financial models. Synagro put up 60 percent of the equity, the Bird Capital Group contributed 20 percent of the capital and Maple Reinders, the remaining 20 percent. Insurer Manulife Financial Corporation supplied the 30-year commercial debt portion, while the Desjardins Group provided a short-term debt facility. Founded in 1986, Synagro Technologies, Inc. provides environmentally sustainable solutions for commercial and municipal organizations that generate organic by-products. Synagro consistently transforms industrial and municipal waste into environmentally friendly resources that benefit our communities. As the largest recycler of organic by-products in North America, Synagro uses best-in-class processes, from beneficial reuse to renewable energy, that adhere to the strictest of environmental regulations to provide compelling solutions for communities across the continent. Serving more than 600 municipal and industrial water and wastewater facilities in the United States and Canada, Synagro’s leading systems of organic by-product management services support municipalities of all sizes in saving money and meeting environmental regulations. Visit synagro.comto learn more.